The price of gold has climbed above the £1,000 per ounce mark once again after last night’s series of Brexit votes in the House of Commons. MPs gathered to cast their votes on seven amendments to the Prime Minister’s Brexit deal, which remarkably featured Theresa May backing Sir Graham Brady’s amendment to abandon the Irish backstop and enter renegotiations with Europe – something she had previously arranged and said was not possible to amend. The Pound has since bounced back slightly, sat at $1.31081 and €1.14673 respectively, but the uncertainty has pushed the price of gold up to £1,002.06 per ounce, having been as low as £976.14 only five days ago. Warnings from the Harvard Business Review and the CBI that companies are not ready for Brexit, as well as concerns from the NHS of medicine shortages and even the threat of martial law on Britain’s streets in the event of social unrest have all contributed to the £26 p/oz gain (approximately a 2.5% rise). Gold’s gains show that there is still significant appetite for gold as a safe-haven investment while Brexit uncertainty continues. Amendment A: Jeremy Corbyn & Labour's amendment to extend Article 50. Ayes: 296. Noes 327. Motion defeated. into account Scotland's majority vote for remaining in the EU. Ayes: 39. Noes 327. Motion defeated. interrupting progress when debating the Withdrawal Agreement or amendments. to the government's Brexit plan - approximately six days of Commons debate. Ayes: 301. Noes 321. Motion defeated. that Parliament can decide what classes as Brexit business. Ayes: 298. Noes: 321. Motion defeated. Ayes: 290. Noes: 322. Motion defeated. Deal outcome is not permissible. There were some humorous takes on the Prime Minister’s actions last night and this morning, with prominent comedians David Schneider and Jack Dee cracking a few jokes at Theresa May’s expense following what was, in effect, the Prime Minister winning a Commons vote by voting against herself. Congratulations to Theresa May who backed the vote to replace the backstop in Theresa May’s deal. Hard luck, Theresa May. You were sure taught a lesson by Theresa May. Half expecting to wake up this morning to the news that Brussels have placed a restraining order on Theresa May. 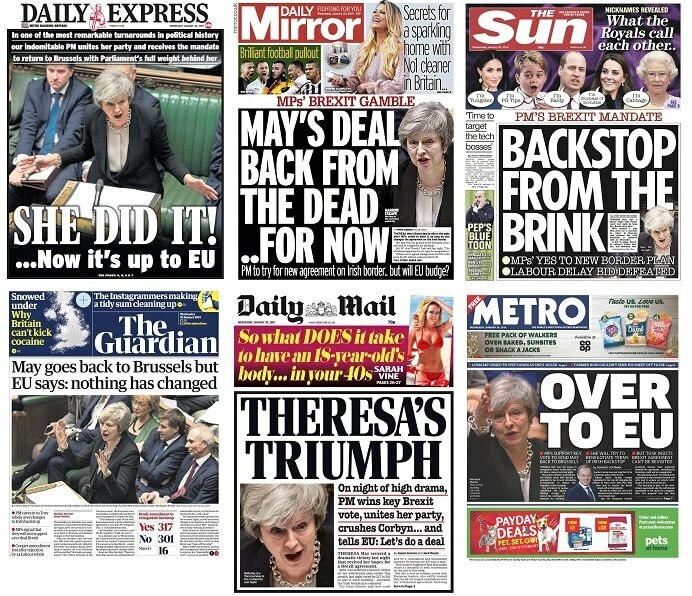 Indeed, it is highly unusual for a Prime Minister to vote against her own legislation, but despite the Prime Minister voting against her own negotiated deal the evening went in her favour, with MPs showing slightly more solidarity. The gamble, in the PM’s eyes, is that it will be third time lucky for her deal – that she can convince the DUP and the European Research Group (ERG) of Tory party members to back her Brexit and finally get consensus in the House of Commons. 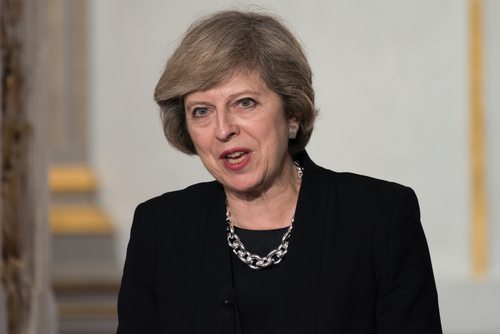 May now has a two-week deadline within which to negotiate with the EU and present a new plan – Plan C – to Parliament. The likely Plan C is the Malthouse Compromise, named after Housing Minister Kit Malthouse. The deal, which is strongly backed by Cabinet minister Michael Gove, seeks to use technology (trusted trader schemes, numberplate recognition) to avoid border checks and these tweaks would, in the eyes of some ministers, avoid the need for a backstop. The order of business for the PM now is Prime Minister’s Questions today at noon, followed by negotiations with the Leader of the Opposition, Jeremy Corbyn, who has agreed to meet the Prime Minister following the government’s defeat by the Spelman Amendment. The amendment expressly states that the House of Commons does not want a no-deal Brexit, which Theresa May acknowledged. Given Labour’s wishes to retain a Customs Union of some form with the EU it’s hard to see much progress being made between May and Corbyn. The PM has levelled several accusations against the Labour leader in recent weeks, while he in return described Theresa May as the “obstacle to a solution”. Labour’s Shadow Brexit Secretary, Sir Keir Starmer, has also accused the PM of appeasing her backbenches and pursuing an impossible Brexit deal rather than making progress. Talks between Theresa May and Jeremy Corbyn to begin today. Worth remembering the overture to these "cross-party discussions" was her leaning over the despatch box, calling him a "national tragedy", a "terrrorist sympathiser" and various other bits of frankly quite edgy material. David Lammy, Labour MP for Tottenham, took to Twitter to argue against the Brexit Secretary Stephen Barclay, who himself had been on BBC Radio 4 this morning to play down the impact of the Spelman Amendment due to its non-binding nature. Now Brexit Sec on #r4today says it's government policy to allow No Deal. Funny how he dismisses Parliament's vote against No Deal last night because it was not binding - and yet is happy to cause recession because of an advisory referendum won on the promise of a new deal. It’s then expected that May will make plans for a trip to Brussels to meet EU officials and demand changes to the Irish backstop, based on the Brady Amendment passing last night. Exclusive; The European Union (all 27 countries and the Commission) has already decided to reject the Brady amendment, should it be supported by MPs. The problem facing the Prime Minister is that EU leaders have already stated on multiple occasions that there will be no further negotiations, and they reiterated this position last night. A spokesman for Donald Tusk, the President of the EU Council, said: “The withdrawal agreement is, and remains, the best and only way to ensure an orderly withdrawal of the United Kingdom from the European Union. The EU’s chief negotiator, Michel Barnier, told reporters this morning that EU Commission President Jean-Claude Juncker will make a statement to the European Parliament this afternoon, while Ireland’s Taoiseach Leo Varadkar spoke of the need to “hold our nerve” in the face repeated demands to reopen talks. Theresa May must present a plan by February 13th, else the government will have to make a statement about what it intends to do next. This would then be voted on, in whatever state, by MPs on Valentine’s Day.